CYPHER-class Mjolnir is a MJOLNIR armor variant designed by Imbrium Machine Complex. Supposedly a pilot program, industrial espionage revealed the CYPHER actually entered mass production in early 2557. This discrepancy has prompted ONI to begin probing IMC's shadowy Io Design Lab. Regardless this suit is not even the most secret of the Io Design Lab's products. Spartan Tom-B292 used the helmet of this armor in 2558. Helmet Description: CYPHER is not the most mysterious of the Io Design Lab's many products, nor is it even the most secret. Body Description: Supposedly a pilot program, industrial espionage revealed the CYPHER actually entered mass production in early 2557. This discrepancy has prompted ONI to begin probing IMC's shadowy Io Design Lab. Render of the Cypher armor in Halo 5: Guardians. 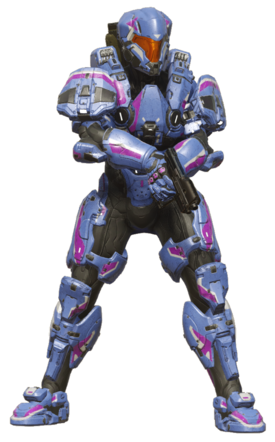 Tom-B292 wearing the helmet of this armor in Halo: Legacy of Onyx. The Copiale and Voynich skins are both named after famous coded manuscripts. The armor uses SCOUT-class Mjolnir for the upper arms and legs.